Divine bodies : sacred imagery in Asian art, Qamar Adamjee, Jeffrey Durham, and Karin G. Oen. Author: Qamar Adamjee, Jeffrey Durham, and Karin G. Oen. What happens when the divine is given a body? Have gods created humans in their image, or is it the other way around? 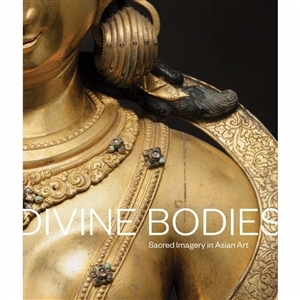 How do people express their values through the forms with which they present their bodies?Divine Bodies is a thought-provoking Asian art history book that explores intriguing questions like these raised by the sacred art traditions of Asia. Approximately 45 artworks from the Asian Art Museum's renowned collection show how artists have envisioned the divine, imbuing it with forms that are meant to reflect supernatural qualities. Additionally, 20 contemporary photographs suggest how some artists today deal with questions about the body and its manifold expressions. The book explores how ideal beauty is interpreted in different Asian cultures, how that beauty can be transformed by altering the forms of the body, how deities maintain their identity despite changes to their form, and how divine beings are represented after their death. By viewing these deity-images, readers whether religious or not-can perceive the messages that artists wish to convey. But Divine Bodies invites readers to do more than just recognize and relate to the meanings inscribed on divine bodies: it also shows how divine imagery shapes and reflects the daily experiences of ordinary people.